"Commemorative Landscapes of North Carolina" documents the state's history through a spatially based presentation of ommemorative monuments, shrines, and public art. This digital collection enables users to visualize and analyze the historical memory of the state of North Carolina by viewing famous and little known sites of memory on modern and historic maps. Sites are linked to a wide variety of resources - postcards, photographs, printed publications, newspapers clippings, and manuscript materials - that reveal when, how, and where North Carolinians have commemorated their past. The collection also encourages users to reflect on what parts of their history North Carolinians have elected not to commemorate as well as how the commemorative landscape of the state is likely to change in the future. "Commemorative Landscapes of North Carolina" is part of the digital publishing program at the University of North Carolina at Chapel Hill Library. It is made possible by the Institute of Museum and Library Services under the provisions of the Library Services and Technology Act as administered by the State Library of North Carolina. "Commemorative Landscapes of North Carolina" is an ongoing project. 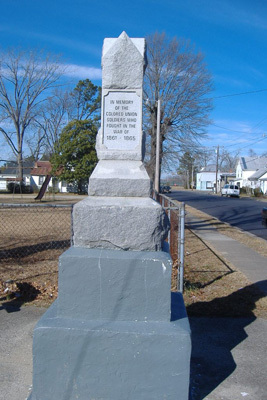 We began by surveying the commemorative sites in twenty five Piedmont counties, in an arc from Rowan to Cumberland counties. In the future we will incorporate the commemorative landscapes in the remaining counties into the digital archive. Please return to the site often and watch it as it grows. Let us know if there are commemorative sites that we have missed or that you would like us to add.